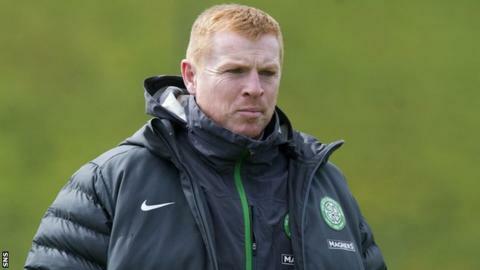 Departing Celtic assistant manager Johan Mjallby expects Neil Lennon to still be the Scottish champions' team boss next season. Lennon has been linked with the vacancy at Norwich City. "He's under contract and I don't see any reason why he would leave," said the 43-year-old Swede who joined Lennon as assistant in 2010. "He hasn't told me anything about that. If you ask me, I think he's going to be still here." Mjallby did not rule out working with Lennon again in the future and thought that the Northern Irishman would one day manage in English football. "He knows the British game, he's played down south as well, so obviously I can see him moving down south one year," said the former Sweden central defender. "It is definitely not that we can't work together. It has been very good, successful and interesting working with Neil." Mjallby says his own decision to leave Celtic at the end of the season has nothing to do with another job offer. "I have still three games to go and then, after 11 May, I am free to work for anyone," he said. "We will wait and see. "There's been a lot of rumours saying I can only see myself working in Sweden, but that's not the case. "Sometimes you need another challenge and I feel I'm brave to be leaving such a successful, massive club to do something else. "I've been thinking about it for a wee while and have been speaking to the club and then we made it official. "That's the only reason. I feel I want to work in football, but maybe work at another club." Although Mjallby admitted that he would like to be a manager in his own right in the future, he is not necessarily looking to do that immediately. "Right now, I'm very happy and confident to do both roles," he said. Mjallby believes that, to some extent, he has done all he can at Celtic, with whom he spent six years as a player. "I'm really happy with my time here and I think we have put Celtic back on the European map a wee bit," he said. "Financially, we are not as strong as we were when I was here as a player, so I'm really proud of this group of players to make the group phase of Champions League two years running. "I'm sad to be leaving the club as I've had 10 years here, six as player and then four in management. "But we have won the title three years running, so maybe it's time for me and the club to part ways." Mjallby is pleased with the progress he and Lennon have made as a management team. "I've been very impressed with Neil in how he has improved, like we all have," he added. "Tactically, he's improved a lot, he's calmed down a wee bit as well and I think he is going to have a very successful career as manager. "He has known about me thinking of leaving for a wee while. It wasn't as if he went down own on his knees and said, 'please stay'. "We have been communicating, so it wasn't like it was a big shock for him."